Does my face make you hungry for meat? Are you Greek? 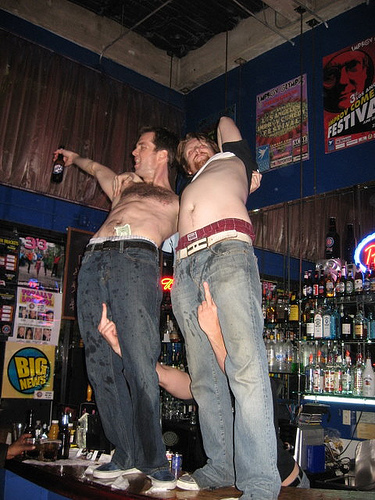 Facebook brought us a very special gift today. A friend of a friend posted a little photographic gem from her trip to Greece. We don’t even know her. 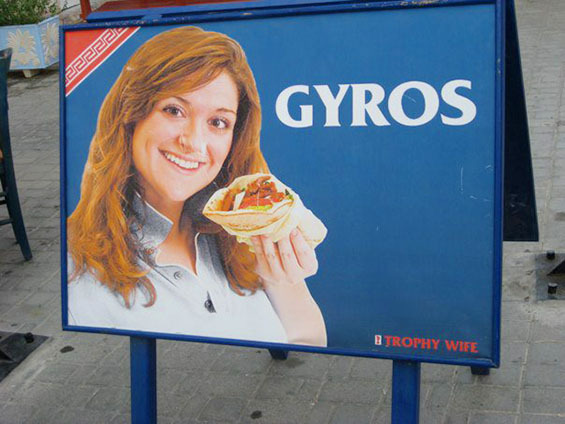 She just thought it was funny that a gyros place would advertise with a poster that reads “Trophy Wife” on it. We, however, think it’s deadly serious, in the AWESOMEST of ways! No matter. What the Pilgrimager told us was that Trader Joe’s is selling already-brined fresh turkeys. Quicker than you can say ‘Pirate’s Booty,’ I was at the Trader Joe’s at Movietown Plaza. How will our store-brined bird turn out? Check back in a few days. If I know Trader Joe, though, I’m guessing it will be gobble-gobble-good! The turkey was fantastic! Get a Trader Joe’s Brined Turkey and you’ve got a party. This doesn’t have much to do with Trophy Wife (if you don’t count the fact that Britney provides the soul-fuel on which we all run) but I can’t help but post it. LEAVE BRITNEY ALONE RIGHT NOW! They’re right, though – Love IS so kickass! No wonder they’re called True!